1915 Hobart 2.5hp vintage motorcycle. Homepage. This page: An insurance schedule acts as a reminder of Hobart motorcycles, built in Coventry. A Hobart motorcycle from 1915. The Hobart, a motorcycle produced in Coventry from 1901 to 1924, hadn't featured anywhere on the site until this ancient insurance document, underwritten by Lloyds in 1923, turned up. No cheap ink-jet printed documents in the 1920s, this is a large format document, part-typewritten, measuring 10.5ins by 16.5ins in size. 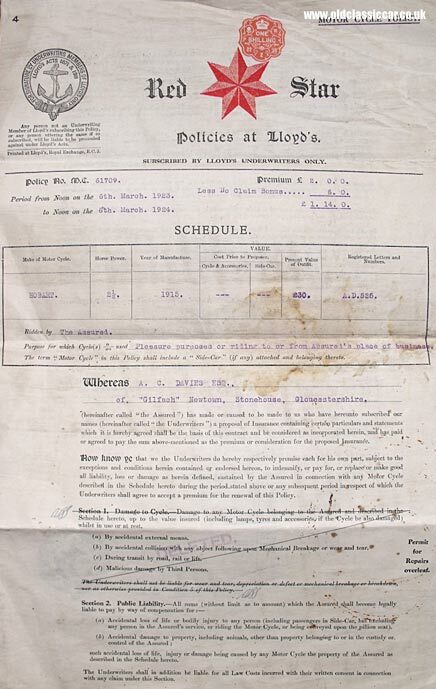 The document provided motorcycle insurance for a Mr A.C. Davies' 1915 2.5hp Hobart machine, valued at the time (1923) at £30 and registered AD 525, a long-running (1903-1921) Gloucestershire series. Mr Davies housed his Hobart at a house named "Gilfach", in Newtown Stonehouse, Gloucestershire, suggesting that the motorcycle had spent all of its first eight years in that county. The property, which survives to this day under the same name, is a three-bedroom end-terrace cottage. Recent sales details suggest there is room for off-road parking but no mention of a garage, perhaps Mr Davies stored the motorcycle in a garden shed, ninety or so years ago? A potted history of Hobart. Hobart Bird and Co. started out in life producing pedal bicycles from a Wolverhampton address in the late 19th Century, before dipping their toe in the waters of engine-assisted cycles with the manufacture of a simple powered-machine in 1901, by which time they'd re-located to Cheylesmore in Coventry. A second model would join their catalogue in 1903, although from 1906 to 1909 they limited their activities to the supply of motorcycle engines, rather than complete machines. 1910 would witness the introduction of the new, 2.5hp, model that incorporated belt drive. The following year a ladies' machine, something the firm would become well known for, would be launched, as would a more powerful, 3.5hp, motorcycle. The bikes were often referred to as the "Handy Hobarts". Until 1913 the company solely equipped their products with engines of their own manufacture, but from 1913 also sold versions available with J.A.P. units. A 225cc two-stroke bike, not renowned for its pace it has to be said, went on sale in 1914, and was upgraded to a 269cc engine from Villiers the following year. Buyers seeking more power could, in 1915, choose a 6hp V-twin, propelled by a J.A.P. engine and equipped with three gears as standard. The bike referred to in the document above is of 1915 build, but the smaller 2.5hp-engined version. This lightweight model initially had a single speed only, but in December 1914 - ie shortly before machine registered AD 925 was produced - a two-speed arrangement was introduced, followed a month later by news that a Chater Lea two-speed gearbox would become standard fitment. Updates and changes to the line-up followed thick and fast over the following years. In 1922 for example, a Blackburne-powered machine went on sale, available both as a motorcycle only, and also in combination with a sidecar for the family motorcyclist. 1924 was, apparently, the final year for Hobart motorcycle production. In 1923 the firm had been taken over by Rex-Acme, a local motorcycle manufacturer, leading to the short-lived Hobart-Acme Motors Limited concern.